Go here to become a Facebook Fan of Nabisco Cookies. 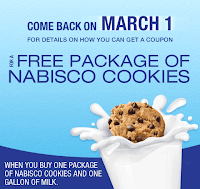 On March 1st you will be able to print off a coupon for a free package of cookies with the purchase of a gallon of milk. They also promise to give out a deal on their cookies on the first Monday of every month to their Facebook Fans. Yummy!